Mark Fortier: If you had to sum up Apple’s “secret sauce” that has driven its customer loyalty and retail leadership, what would it be? Carmine Gallo: The Apple Store’s “secret sauce” is written on the front of a wallet-sized credo card all employees are encouraged to follow: Enriching Lives. When you start with the vision of “enriching lives,” magical things to start to happen and you come up with innovations to outsmart your competition and provide a better customer experience. MF: How can non-retail businesses benefit from the Apple secrets you reveal? CG: Any business that involves people should study the Apple Store for lessons on how to make people (employees and customers) feel special. For example, the Apple five steps of service that employees are instructed to follow in every conversation apply to the retail store or any other customer-facing interaction. The Apple steps of service are spelled out in the acronym APPLE: Approach customers with a warm welcome, Probe politely to understand all the customer’s needs, Present a solution for the customer to take home today, Listen for and resolve any issues or concerns, End with a fond farewell and an invitation to return. Whether you run a small coffee shop or a national retail chain, the same techniques apply to creating a great customer experience. MF: Is Apple’s retail strategy very different from what other retailers do? How? CG: The Apple strategy is very different from what other businesses do. Remember in 2001 when Apple opened its first retail store, businesses were trying to find ways to talk to their customers less. Apple found ways to talk to their customers more. Few analysts gave Apple a chance because they didn’t believe a retailer could grow by focusing on the customer experience instead of the hard sell. In most retail settings, if an employee spends one hour with a customer and it doesn’t lead to a sale, the employee will be reprimanded. In the Apple Store, employees have no time limits. As long as the customer leaves with a smile on her face, that’s all that matters. MF: If we walked into an Apple store tomorrow what signs, tricks and strategies should we look out for of their attempt to engage us as customers? CG: Someone will greet you immediately upon entering the store. If the store is especially busy, more people will be positioned at the entrance. Research has shown that how people are greeted significantly impacts their perception of their entire experience. Apple Store employees are trained to reset your internal clock. For example, an employee might tell a customer that it will be about 10 minutes before a sales associate (specialist) can help them. About 5 minutes later, the employee will find the customer and say, “I just wanted to let you know that our specialist—her name is Linda—knows your next and will be with you in 5 minutes.” When the customer is asked how long they waited, the answer is typically “5 minutes or so” and not “10 minutes.” Watch for employees resetting your internal clock. Also pay attention to how they say goodbye. Apple Store employees are instructed to “end with a fond farewell” and an invitation to return. 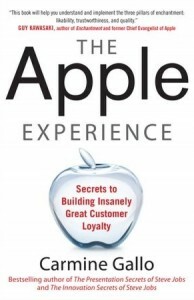 MF: Are Apple’s strategies manipulative of the customer or do they respectfully put the customer in the driver’s seat? CG: I would not use the word “manipulate” because it implies skillful persuasion in a way that might be unfair to the customer or client. In other words, a manipulative salesperson would want to sell you a product whether or not it was the right one for you or the salesperson might persuade you to buy unnecessary add-ons. In an Apple Store, employees are not pressured to sell products as much as they are encouraged to create a great experience, to answer questions, and to build a customer for life. MF: What are Apple’s “5 Steps of Service” and how does this distinguish the experience that customers get from Apple retail employees? CG: The Apple 5 steps of service are guidelines that all Apple Store employees are taught to follow in each and every customer interaction. These steps work are spelled out in the acronym APPLE and work for any company in any field. In fact, the steps are modified from The Ritz-Carlton steps of service created twenty years ago! MF: Where did Apple get its retail approach from? Did they study other retailers or businesses? CG: You bet they did. Steve Jobs asked the question, “Who offers the best customer experience?” The answer was The Ritz-Carlton. Apple executives studied The Ritz Carlton and Four Seasons, primarily. Twenty years ago The Ritz-Carlton created its 3 steps of service. Apple copied it nearly word for word. Today, many brands are copying Apple Retail: Microsoft, AT&T Retail, Tesla, Disney, J.C Penney, and others. MF: What will a customer in an Apple store experience on the day of a new product launch like the new iPad? CG: The experience starts before customers enter the store. Apple Store employees hand out bottled water, coffee, and energy bars to people standing in line (warm welcome). Specialists will talk to customers in line, answering questions and touting some of the features of the new iPad. When the doors open, employees will cheer and greet each customer by offering their name and a handshake. A brand cannot train employees to be this cheerful. That’s why the Apple Store hires as much for passion and personality as it does for technical expertise. In fact it’s even more important to be passionate and friendly than to know everything about Macs. MF: How does Apple establish an emotional connection with both employees and customers? CG: The Apple Store experience is all about enriching your life and building a loyal customer. When you enrich lives it means you empower your employees to do what is right for the customer without fear of reprimand from the boss. It means you create areas in the store where customers can touch and play with the products. It means you offer classes and personalized instruction to educate customers. It all starts from the vision to “enrich lives” of customers and employees. MF: How does Apple define and achieve a profitable customer relationship? CG: It’s called “the ultimate question.” When you purchase a product, Apple will send you a survey. The ultimate question is, “On a scale of 1 to 10, how likely are you to recommend Apple?” Apple wants to see 8, 9, or 10. MF: You discuss the ‘internal clock’ of customers; is it possible to reset a customer’s expectations in terms of time, to improve their level of satisfaction? CG: Focus group research has shown that if a person is greeted warmly upon entering a store, that person’s perception of how long they waited for service is significantly impacted. People are much more comfortable waiting after they have been greeted warmly and are more likely to recommend the service to others. MF: How can retail stores and products be designed to better appeal to buyers and their “buying brains”? CG: Retailers must remove the clutter from their display areas, create simpler content and marketing materials, and build areas where people can see and touch the products without high pressure salespeople. MF: In what ways could all companies learn from Apple’s approach to hiring and training its retail employees? CG: Apple doesn’t care about how much you know as much as it wants to know how much you care about people. Hire for smiles. Hire for friendliness and passion and personality. You can teach the rest. MF: In the age of the Internet, why does anyone want to show up at a store? CG: You’re right. People don’t want to go to a store. A store must be more than a store. It must be a place where people are inspired, entertained, elevated, and made to feel special. That’s the Apple way. Carmine Gallo has written several internationally bestselling and award-winning books, including The Innovation Secrets of Steve Jobs and The Presentation Secrets of Steve Jobs. A former anchor and correspondent for CNN and CBS, Gallo is currently a communications coach for the world’s most admired brands, and a columnist for Forbes.com. He has been featured on ABC’s 20/20, MSNBC and CNBC.